Today the Southern Paiute Indians live on ten reservations in Arizona, Utah, and Nevada. The San Juan Southern Paiute live in and around Tuba City on the Navajo Reservation. They are in the process of petitioning the Bureau of Indian Affairs (BIA) for tribal lands. The Southern Paiute's traditional territory included much of southern Nevada, northern Arizona, and southern Utah. They were a hunter-gatherer society that developed some farming. The Southern Paiute's language is similar to that of the Pima and Papago cultures. When the Spanish arrived they took Paiute boys and men and sold them as slaves to the miners in Central Mexico. 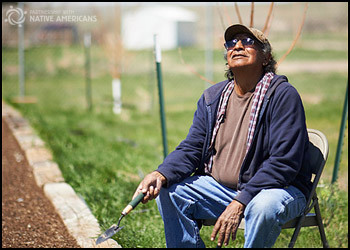 The Southern Paiutes quickly lost their land in the 1800s and became laborers and craftsmen.
" The traditions of our people are handed down from father to son. The Chief is considered to be the most learned, and the leader of the tribe. The Doctor, however, is thought to have more inspiration. He is supposed to be in communion with spirits... He cures the sick by the laying hands, and prayers and incantations and heavenly songs. He infuses new life into the patient and performs most wonderful feats of skill in his practice....He clothes himself in the skins of young innocent animals, such as the fawn, and decorated himself with the plumage of harmless birds, such as the dove and the hummingbird..."